Applicable starting with August 2010 QA build. This document covers organizing your GFx for import into Unreal Engine 3, working with textures and sharing resources between Flash movies. 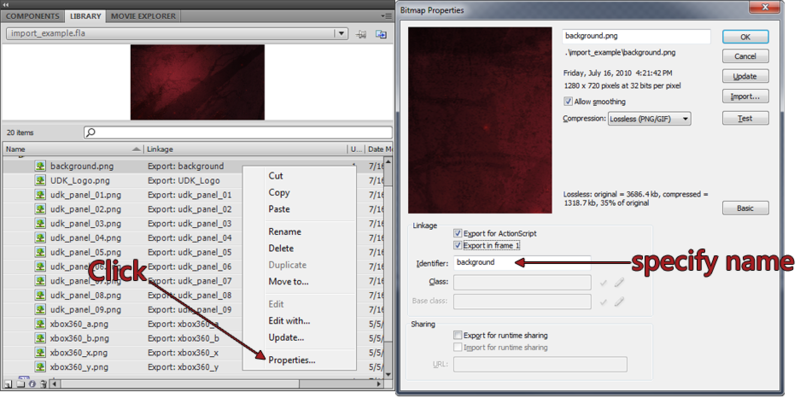 In order to import .SWF files into Unreal Engine 3 they must be located in a directory within the GameDir\Flash folder. For example, in UDKGame a valid location for a .SWF file would be C:\UDK\UDK-2010-07\UDKGame\Flash\example\SomeFile.SWF. Unreal Engine 3 will use the location of the file to determine the package, group and name of the asset during import. For instance C:\UDK\UDK-2010-07\UDKGame\Flash\example\SomeFile.swf would be imported as SwfMovie'example.SomeFile'. Technical note: This is necessary so that relative references between .SWF files can be translated into Unreal Engine 3 full paths. The import dialog provides options you may set which affect how a .SWF file and its associated assets are imported into Unreal Engine 3. If enabled, marks imported textures as sRGB. If enabled, Unreal Engine 3 will pack small textures into larger texture atlases, and use UV offsets to reference individual textures. Maximum size of packed textures, if the pack textures option is enabled. This allows you to select how textures are scaled upon import. Non-power of two textures cannot have mip maps and will not stream. To improve iteration time, the gfximport commandlet, run from your Unreal Engine 3 executable (e.g UDKLift.exe) allows for content importing and reimporting without loading Unreal Editor. The commandlet assumes that content has been arranged in the manner described above. In order to import a file, you must run gfximport commandlet while specifying relative paths to all of the .SWF files within the GameDir\Flash directory that you wish to import separated by spaces. In order to re-import files that are already imported into UE3, simply run the commandlet with no arguments. The commandlet will reimport all the SwfMovies for which the .SWF file on disk is newer than the one imported. Suppose you want to import these files. They will be imported into the UI package as SwfMovie'UI.MainMenu' and SwfMovie'UI.Resources'. The package will be saved as GameDir\Content\GFx\UI.upk. In Unreal Editor, open the Content Browser. At the bottom left hand side of the Content Browser, click on the import button. Navigate to your file location, and select the .SWF movie(s) you wish to import and click Open. The file must still be in GameDir\Flash directory. During the import process, all textures used by the .SWF files will be imported as textures into the package you specified. Unreal Editor will attempt to find the original .PNG texture based on the linkage identifier. Unreal Editor will warn you about any textures that cannot be found. Textures imported on behalf of the .SWF will have their sRGB flag is set to False. This is necessary in order to match Flash's rendering approach. As a result the texture thumbnail will appear bright and washed out in the Content Browser. In the example below FlashTest imports macaw.png, which will produce the desired result despite looking overly bright. Macaw_wrong.png has the sRGB flag turned on; it appears correct in the Content Browser but will be too dark in the rendered output. When authoring content, also ensure that all textures within your .FLA Library are set to Lossless (PNG/GIF) compression in their properties. If this is not the case, there will be some artifacts and undesirable colors translated to the texture in engine due to the JPEG compression. Only the standalone flash player will be affected by this, as Unreal Editor will import textures from the original .PNG files. Make sure that Allow Smoothing is checked in texture properties if you plan to scale the texture. Otherwise, the scaled texture will appear very pixelated. All the textures must be placed in a sibling folder with the same name as the .swf file that you export. For example, suppose you are working on a file called import_example.fla. C:\UDK\UDK-2010-07\UDKGame\Flash\example\import_example\UDK_Logo.png      <-- Where UE3 expects to find your textures! In the library panel, locate the resource of the texture that you want to change. NOTE: This is not the instance, but the resource. It should have a little icon of a tree next to it . Right-click the desired resource, and select Properties. Under the Linkage section, check both the Export for ActionScript and the Export in frame 1 checkboxes. Do not use periods in the identifier! Since periods are illegal in asset names in Unreal Engine 3, Unreal Editor will replace any periods with underscores when it imports the texture resource. However, GFx will still try to load the texture using the period, resulting in no texture being loaded! For textures that rely on strong lines or gradients, texture compression can sometimes ruin these textures. This can be resolved in a few ways. Ensure that the texture's LOD group is set to UI. Double check the UI LOD group's settings in your Engine.ini file. If the Bias is set to anything other than 0, it will force Unreal Engine 3 to use a different mip map of the texture. Disable mip maps for these textures. This will disable texture streaming, but only do this for UI textures! Try splitting up the textures to improve colors. Because compression typically blurs textures, this can also cause color distortion. By simply layering elements instead of using a single texture, this can help to improve the overall color. Experiment with non bilinear scaled textures. If you require the use of very straight and accurate texturing then some of these artifacts will be amplified by bilinear filtering done with scaled textures in game. Thus experimenting with non bilinear scaled textures may be worthwhile to improve visual quality. Experiment with the texture compression methods within Unreal Editor. Sometimes using something other than TC_Default may divert more resources towards different texture channels that could be useful. This may however alter the compression settings which may lead to more memory being used. If parts of the textures are very dark, it may be resolved by inverting the colors and then setting the brightness of the texture clip within Flash to a negative value (e.g. -100) or by tinting it black. This may resolve green and/or purple compression artifacts that occurring in the dark parts of your texture. If parts of the textures have alpha, and texture compression is causing less than desirable results, then authoring the movieclips with alpha in mind will help to alleviate those issues. Save the texture without the alpha channel will usually improve visual quality in the textures. If all else fails try doubling the resolution of these textures to reduce the overall impact of texture compression. The most common form of resource sharing is using a .SWF file as a library of textures which are in turn used by other .SWF files. For example, you may have a .SWF with a set of all textures used by menus in your game; the various menus can refer to those textures in order to avoid content duplication. This example of resource sharing demonstrates asset sharing between different SwfMovies as well as different packages. Notice that buttons.swf is located in the example_resources/ directory, which will result in it being imported into example_resources.upk. Meanwhile, example/uses_resources.swf is in example/, and will be imported into example.upk. The first step is to create the .SWF that will serve up the textures to other .SWF files. In this example, this role is delegated to buttons.swf. Import the texture into the library as you usually would. Right-click the resource and choose Properties. Compression is set to Lossless (PNG\GIF). Using JPEG will result in Error: Jpeg System is not installed - can't load jpeg image data. The identifier field matches the name of the PNG file you are using for this asset (minus the file extension). Make sure Export for runtime sharing is checked. Verify that the Identifier field does not contain any periods! Test the file with the GFx Player. You should not see any warnings. Importing for runtime sharing is demonstrated in example/resource_sharing.swf. 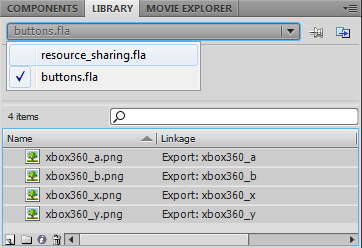 Make sure both buttons.fla and resource_sharing.fla are open in your Flash content creation package. Under the Library tab, select buttons.fla. You should now see the texture resources available in buttons.fla. Select the resources you wish to share; then right-click and choose Copy to copy them. Switch the library to resource_sharing.fla. Right-click and choose Paste to paste the textures into the library. Check that Identifier is set correctly. Check that Import for runtime sharing is checked. Change the URL field to be the relative path to the .SWF containing the resource. In this example the path is ..\example_resources\buttons.swf. There is no good tool to do accounting for batching or dependencies. If you have multiple SWFs that depend on each other, you can use the import commandlet and specify each SWF to import so they all get imported accordingly. Avoid using vector gradients within Adobe Flash Studio via their vector Gradient fill methods. If you need a gradient, make a bitmap! The reason for this, is how the gradient is then exported once you import the .SWF into Unreal Engine 3. It creates multiple textures for that gradient, which is very inefficient! Avoid using vector gradients at all costs, just create a bitmap gradient instead. CLIK Buttons use Scale9 to adjust their sizes based on the width of the text. The button instance itself is resized, so any content within the instance will appear distorted. If you are having undesirable results, you can make enough room for localized text, or adjust your art accordingly to fit closer to the bounds of the initial text. When working with CLIK components, always make sure the movieclip has its property and component definition pointing to the right class. Both of these class definitions will be the same, but you need to set it in two locations. Always ensure the identifier name is set properly. For example when working with ScrollingLists; the identifier of the ListItemRenderer is what the ScrollingList uses to draw objects in the list. This can cause headaches, bugs and frustrations when something doesn't work. Where possible always use power of two textures. While non power of two textures are supported in GFx, Unreal Engine 3 does not currently support them, and will scale your textures up to the nearest power of two. This can cause larger files, distortion and undesirable artifacts. Keeping texture sizes consistent and working only with power of two textures will make sure this is never a problem. Multiple layered masks and masking has a negative effect on performance. Keep masks simple! This assigns the value of the parent's CLIK label property to the text property of the text field. Ensure that render target textures are smaller than the frame buffer to ensure visual parity on consoles.